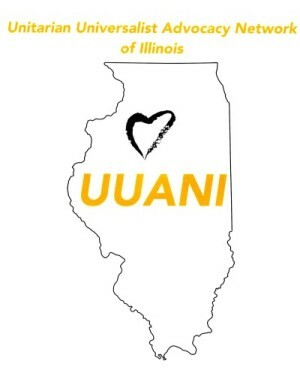 UU Advocacy Network of Illinois – Building Community for Justice. UUs across Illinois coming together to work for justice, beloved community, and a healthy planet, putting our deepest values into effective action. www.UUANI.org. if you’re interested in helping plan these or other events. if you are interested or would like to nominate someone. Sunday Oct 21, 11:30-5:30 (CST): Phone banking to Florida for Amendment 4, which would restore voting rights to over 1.4 million Floridians with past convictions. Tuesday Oct 23, 7:00pm: Listen, Lead, Share: A Conversation on Clean Energy at Countryside Church UU (1025 N Smith St, Palatine). Saturday Oct 27, 10am-2pm and Sunday Oct 28, 2pm-6pm: Voter canvassing with Illinois Jobs with Justice at DuPage UU Church (1828 Old Naperville Road, Naperville). Monday Oct 29, 6:00pm: Listen, Lead, Share: “Get the Lead Out and Let the Sun Shine In” Community Wellness Forum at Loretto Hospital (645 S Central, Chicago). Sunday Nov 4, 2pm-6pm: Voter canvassing with Illinois Jobs with Justice at the UU Society of Geneva (102 S 2nd St, Geneva). Tuesday Nov 6: Election Day. Wednesday Nov 7, 6:00pm: After the Election: What’s Next? A town hall on the 2019 agenda for Illinois with Representative-elect Maurice West, Jr, at the UU Church, Rockford (4848 Turner St, Rockford). Saturday Nov 10, 9:30am: “Building Religious Communities to Save Democracy” Chicago Area UU Council conference in partnership with Meadville Lombard Theological School at Countryside Church UU (1025 N Smith St, Palatine). Thursday Nov 15 at 6:00pm: Listen, Lead, Share at McHenry County College (8900 US Highway 14, Liebman Science Center, Room F208, Crystal Lake). Friday-Saturday Nov 16-17: Beloved Conversations retreat with six Chicago area congregations. Tuesday Nov 20, 6pm: Peoria Transgender Day of Remembrance at the UU Church of Peoria (3000 Richwoods Blvd, Peoria). by the 15 of the month. In terms of our UU values, we’ve won a few victories in Illinois so far this year – notably the FATE restorative justice bill – while several other efforts await the Governor’s signature. Of course, the biggest decisions yet to come are the upcoming elections. The UUA, the Poor People’s Campaign, UUANI and many others are all focusing in this direction. The times are calling for a clear and sustained “accumulation of acts” – as Clarissa Pinkola Estes puts it in her visionary post, “We were made for these times” – from we who dare to claim the centrality of love. Accordingly, beginning this week UUANI will be sending out one focused call to action each week – the first one is below. With so much coming at us these days we need all hands on deck, and our hope is that this will offer a way for each of us to do at least one thing each week rather than getting overwhelmed by it all. Moreover, these will be actions we can do as UUs, framed in our UU values, in ways we can share with our congregations on Sunday mornings, together with other UUs around the state. After lengthy negotiations, a version of the Illinois Clean Jobs bill significantly ramping up renewable energy and energy efficiency will likely come to a vote by state legislators before December 1. We will talk about ways to take action on it during the fall veto session (Nov 15-17 and Nov 29-Dec 1) on our October 25 Action Council call (see below). The September 12 National Moral Day of Action in Springfield, Chicago, and 30 other cities was a success! Diverse faith leaders and people impacted by injustice came together to raise the level of public discourse to higher ground, away from extremist politics and policies that benefit the few and toward policies and laws that value people and the planet. UUANI led the Day of Action in Springfield, where we mobilized 120 people from 6 faith traditions, 7 organizations, and 15 geographic communities around the state (including over 70 UUs from 12 congregations) – an important step as we pursue building a fusion coalition in Illinois. See photos and more in our Facebook group – where we encourage you to get into conversation with other UUs around the state about promoting our values effectively in the public arena! …to promote Worth and Dignity – Justice, Equity and Compassion – Respect for the Interdependent Web. There’s a lot happening these days, folks. Show up when you can and stay woke! This is a momentous time for racial justice in our country. The historic and systemic devaluing of Black lives is a long-standing reality we are collectively being forced to confront anew. As Ta-Nehisi Coates makes clear, it is time to wake up from our dream of a post-racial society and face the nightmare of violence, inequity, and dehumanization which affects us all—but kills some of us more than others. Racism is reflected in the disproportionate impact on people of color of the budget crisis, the environmental crisis, economic inequality, inequities in the criminal justice system, political disenfranchisement…the list could go on and on. The point is not to say that there is only one issue, but to see the intersections between all the issues. 1. Wake Up – Do our own work – Get up to speed – Talk to other white people. The state spring legislative session is almost over, but there are still opportunities to make a difference before it ends May 31. Illinois’ budget impasse continues, affecting those most vulnerable among us most severely. It is being reported that a bipartisan group of legislators has put forward a budget deal that would raise $5.4 billion in new revenue with no cuts to human services. Call 844-311-CUTS (844-311-2887) to call your state legislator or click here to demand that a responsible budget with adequate revenue to fund vital services be enacted NOW. Check out UUANI’s Facebook group to see UUANI Board member Bill Sasso speaking out for a responsible budget in Carbondale and UUs advocating in Springfield! Congratulations to those in the Champaign-Urbana area who helped get Sen. Bennett to sign on as the 30th co-sponsor (out of 60 Senate members) of the Clean Jobs bill!